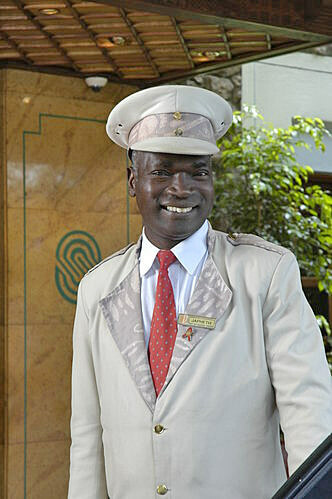 The Nairobi Serena Hotel, Kenyatta Avenue, Nairobi, Kenya, is part of an Africa-based hotel chain that celebrates its cultural roots. I stopped there on my way to my first safari in Kenya, and returned recently for a second stay just to have another chance to see their vast collection of artwork from all across the continent. 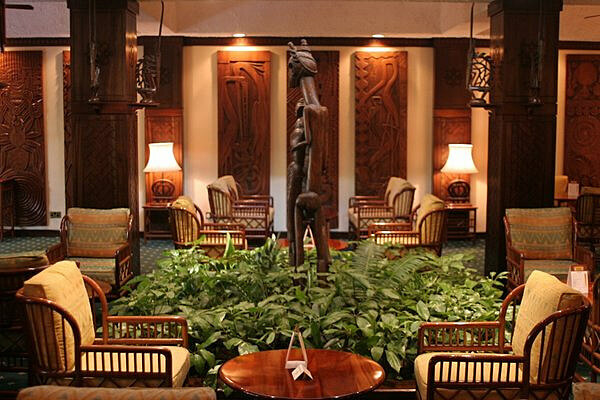 Everything from jewelry to statues, tapestries to carvings, antique to contemporary is showcased in this, a most “African” hotel. While the items on display in the public areas are of museum quality, great care has been taken to use decorative motifs from across the continent in the hotel rooms as well, including hand-crafted furniture. 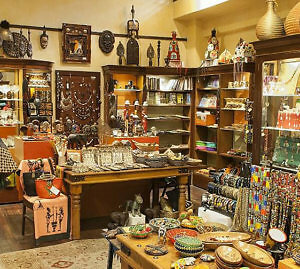 Local handicrafts, glassware, pottery, beadwork, and clothing are featured in the hotel’s Hazina Gift Shop. 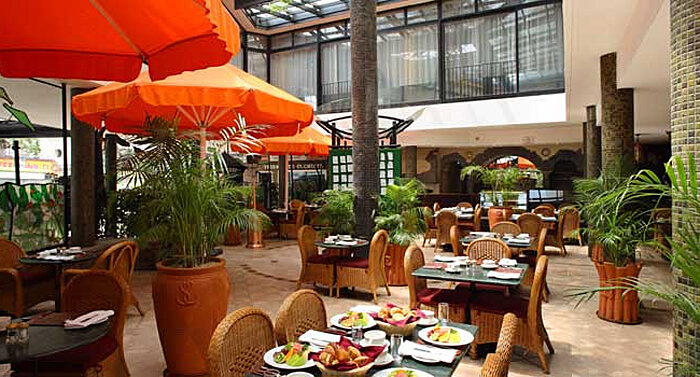 The hotel is an oasis of calm just outside the city center, separated from bustling downtown Nairobi by Central Park. It’s surrounded by lush tropical gardens with jacaranda, acacia trees and the riotous color of bougainvillea blossoms. That said, I encountered no problems walking or taking taxis around the capital as a solo traveler. This is a classic, upscale Western-style hotel, with all the expected services and amenities including free WiFi, a business center, fitness center, swimming pool, hair salon and spa. Because it’s located outside the city center, there’s free parking. The services at the Maisha Spa make it a popular post-safari stop. The facility includes a heated pool, steam and sauna rooms, gymnasium and aerobics studio. Maisha (which means “life” in Swahili) also offers massages, facials, body scrubs, aromatherapy and reflexology. There is an elegant restaurant, Mandhari, for fine dining at lunch or dinner. 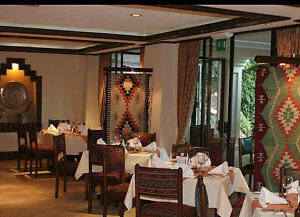 The more casual Café Maghreb (open 24 hours) offers international breakfast and lunch buffets and a table d’ hôte dinner. A coffee shop and two bars also are available. The Nairobi Serena offers a handful of “smoking” rooms for guests — something you’ll not find these days in Europe or the Americas. One caveat: since my stay in the Nairobi Serena, the hotel has embarked on an extensive remodeling campaign. While the hotel remains open and “guest inconvenience is kept at a minimum” you’ll inevitably encounter some reconstruction hassles. Management notes that all restaurants and other food and beverage outlets, and the Maisha Health Club and Spa remain “fully operational” during the refurbishment period. It’s all expected to be finished by May 2018. 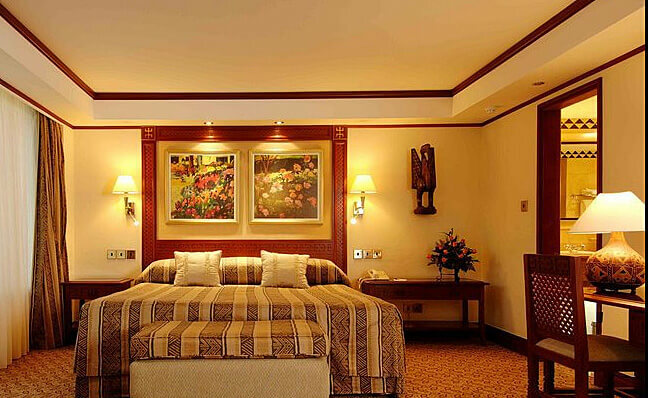 The Nairobi Serena Hotel is a member of Leading Hotels of the World. Weekend specials can be as low as $175 per night. You can book at the hotel’s site or through the various booking sites such as Travelocity. The 35 Serena hotels, resorts, safari lodges and camps, palaces and forts are located in East Africa (Kenya, Tanzania, Zanzibar, Rwanda), where you go on a safari in Uganda, Mozambique, and Southern Asia (Pakistan, Afghanistan and Tajikistan).